Dogs only have a handful of activities, eating, sleeping and playing. All three are important to keep a dog happy and healthy in their lives and all three need to have attention given to them to make sure they’re done right. We’ve covered getting the best wet dog and the best dry dog food in their diet and now we’re going to cover the best high fibre dog foods available. You may be wondering why dogs would need high fibre in their diets in the first place and this page will help you get the information you need to see if it will help with your canine’s health. Why feed your dog fibre? Fibre is an extremely important part of a healthy diet for practically any living organism, not just dogs. Many people associate fibre with the digestive system and ‘moving things along’. Fibre is a complex carbohydrate that comes in two forms – soluble and insoluble. Soluble fibre is fibre that is broken down in the body with water. Fibre is sometimes called roughage, or bulk, and can only be found in plants. Now you can see why many people, not just dogs, struggle to get enough fibre. Fibre is not present in meat, fish and dairy. Fibre also contains no nutritional value so it is useless on its own. Despite this, Fibre has enormous value to offer. The benefits of high fibre foods for your dog are numerous. Dogs can get the same health problems as humans do despite their superior immune system and overall cardiovascular system. A dog with a poor diet and no exercise will develop the same problems a human would – except they won’t tell you their having issues leaving the responsibility with the owner. You! Please note, we do not recommend feeding your pooch the following, it’s just to highlight some natural foods which contain high fibre. Please research or speak to a vet before feeding your dog any of these. Fibre response dry food comes from the Royal Canin brand who have a reputation for making excellent dog food that is great for their health. As most high fibre foods are dry (wet dog foods contain the meat, protein, but no fibre) usually the fibre needs to come from the kibble. This stuff has a host of health benefits not just fibre and should keep your pup or pooch very happy. Feed with a high dietary fibre content. 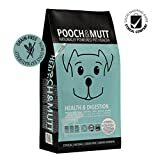 Another dry food option is the Pooch & Mutt brand of (love the name) high fibre dry food. High in fibre and containing Probiotics and Prebiotics (to aid digestion), Charcoal and Psyllium (a fibre source that promotes firm stools) this option is a great choice to go along with some wet food. A wet food option which contains a lot of fibre is the Purina brand’s Pro Plan. You can get this stuff in a pack o f 12 and is ideal for dogs who don’t like kibble or dogs who have trouble chewing such as an elderly dog. High protein, low calories and high fibre make this a great choice if your dog is struggling with obesity. Low calorie: reduced levels of fat to help reduce the number of calories consumed. Some senior dogs have special dietary requirements, if you have one of those then try the OSCAR brand of Adult Care High Fibre dog food which has all the nutrition and adult hound needs as well as that all important fibre. This low fat, high fibre diet is ideal for senior dogs as well as adult dogs, dogs with pancreatitis and / or diabetes and to prepare them for older age. The high fibre content and added Lignocellulose helps your dog feel fuller for longer. Ideal if you want your dog to lose a little weight at only 329 Kcals ME/100g and only 8% fat. High Fibre Lite also contains three times our usual amount of L-Carnitine to help your dog metabolise body fat. Glucosamine for joints. Fish oils to help brain development, helping to keep your dog alert and attentive. Biotin for a shiny coat and healthy paw pads. Chelated Zinc and Manganese to help the body absorb these essential elements faster. The Burns brand dog food, much like the Purina wet food, is designed to help with obesity if your dog has already reached a place where they having problems. Hypoallergenic and easily digestible not only will this stuff help make your dog healthier but they’ll enjoy eating it too! Want to add fibre to their diet but don’t want to switch foods? Try out the fibre supplements by Protexin. Easy to swallow and reduces the hassle of switching foods if you have a fussy dog. Want a fun way to add fibre to your dog’s diet! Try these treats! Extremely tasty and can be used to reward your dog and almost trick them into becoming healthier!